High ranking German officers visited Prague to discuss the affiliation of the 4th Rapid Deployment Brigade with the Bundeswehr’s 10th Armoured Division – Czech Air Force will provide patrols in the Baltic airspace of Lithuania, Latvia and Estonia from September 2019 – a memorandum of cooperation signed between the Ministry of Defence and the VOP CZ concerning the acquisition project of the IFV’s – Czech Republic joined the NATO 20 years ago, major celebration event will be held in Prague on 12th March - German neo-nazi groups were training with firearms in the Czech Republic (and Bulgaria) in recent years German governement says. On 28th January Brigadier General Michael Podzus, second in command of the 10th Armoured Division, and commander of the 37th Armoured Brigade, Brigadier General Gunnar Brügner, of the German Bundeswehr, visited Prague to discuss procedures of the affiliation of the troops of the Czech 4th Rapid Deployment Brigade with the 10th Armoured Division (within the Framework Nations Concept, FNC). They were welcomed by the Land Forces Commander Major General Josef Kopecký. Czech Air Force will provide patrols in the Baltic airspace of Lithuania, Latvia and Estonia for four months from in September 2019, with its JAS-39 Gripens. The body will include 100 soldiers (pilots and ground personnel), and 5 fighter jets. It will operate from the Amari Military Airport (Estonia), as part of the NATO Air Defence Quick Reaction Alert. It is going to be the third mission in the Baltics for the Czech Air Force after 2009 and 2012. On 30th January Minister of Defence Lubomír Metnar and managing director of the state owned company VOP CZ Marek Špok have signed a memorandum of cooperation concerning the purchase of the tracked Infantry Fighting Vehicle, the largest acquisition project in history of the Czech Army. The aim of the cooperation is to bring as large part of the production to the Czech Republic as possible. VOP CZ should also provide warranty and post-warranty servicing, eventually further development of the vehicles. 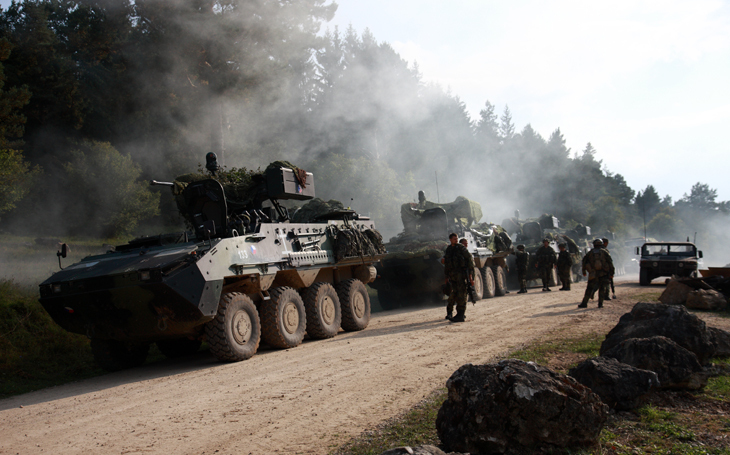 VOP CZ will act to integrate the Czech defence industry and deal with local suppliers and sub-suppliers. This year the Czech Republic will celebrate 20 years from joining the NATO (North Atlantic Treaty Organisation); it became member on 12th March 1999. A major event will be held at Prague Castle (site of the President), and Czernin Palace (Ministry of Foreign Affairs), attended by head representatives of the V4 countries (Poland and Hungary have also joined the NATO on the same day together with the Czech Republic as the first of the former eastern block states; Slovakia joined the Alliance on 29th March 2004). According to the DPA, German government say members of German neo-nazi groups were training with firearms in the Czech Republic (and Bulgaria) in recent years. Members of a group called “Combat 18 Deutschland” arrested in September following their visit to the Czech Republic, their car searched and a large quantity of ammunition was found and seized, according to the BfV (German Federal Office for the Protection of the Constitution). The Czech NCOZ (Czech National Centre against Organised Crime) said it collaborates with the German police, and did not issue any further comment.